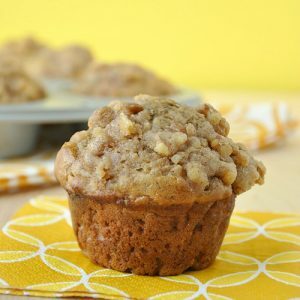 Fluffy homemade apple cinnamon banana-nut muffins with a buttery walnut streusel topping. These bakery-style muffins have enough muffin top to make your day! Pre-heat oven to 350 degrees F and allow cold ingredients to reach room temperature. Line a muffin tin with parchment paper liners or lightly grease. Next coarsely grate your apple with a box grater then chop it into little pieces for apple in every bite! Mash the banana with a fork until smooth. Add both to a skillet along with coconut oil, sugar, cinnamon, allspice, and nutmeg and saute until tender and fabulously fragrant. Remove from heat, transfer to a large bowl, and allow to cool to room temperature. While you wait, prep the rest of the recipe. Mince your walnuts until they're super fine (feel free to use a food processor) and combine with remaining streusel ingredients. Mash and mix the streusel with a fork and/or your fingers until it transforms from powdery to paste-like. The result should be a crumbly, buttery streusel that makes you want to lick your fingers! Make the mixture as sweet or cinnamon-y as you'd like. Next combine carefully measured flours, baking soda, baking powder, and salt in a medium mixing bowl. Set aside. Grab your cooled apple-banana mixture and whisk together with yogurt and eggs. Using a sifter or sieve, slowly sift flour into wet mixture as you mix the two. Stir until just combined. Use a tablespoon to divide batter evenly between 9 muffin cups. (I added a TBSP and a half to each cup) Add a hearty later of streusel on top of each. Bake at 350 F for 15-18 minutes depending on muffin size. Test with a toothpick in the center around the 15 minute mark and if it comes out clean, pull the muffins; otherwise, test again in a minute or two. Allow to cool and enjoy! I highly recommend stuffing at least one in your face once they're still hot. So. Much. Yum! Wrap tightly and store on your counter for a few days if needed; 25 seconds in the microwave makes these absolutely divine the next day! Serve them straight up or slathered in apple butter, coconut butter, or even peanut butter. I had to double the streusel topping a few times because my "taste test" turned into me eating it straight from the bowl. Cookie dough fiends will understand; I couldn't help myself! The muffin recipe above is very lightly sweetened from the ripe banana and honey. Used to a little more sweet stuff in your muffins? Feel free to add brown sugar, sugar, or preferred sweetener as desired.